This Drive to Trust trailer offers a quick behind-the-scenes look into why I’m doing it. Drive to Trust is CSRA’s major initiative this year. We’re partnering with firms in all kinds of industries to show that trust-building in digital public achieves marketing goals much, much better than promotion. These daring organizations will learn how to change how they relate to people, and they’ll become much more competitive. If you’d like to watch this post instead of reading it, just click the thumbnail button. So is Drive to Trust Just Another Consulting Service? You can think of it as a service, but it’s a lot more because it has a higher purpose. When other firms see the results, they’ll want to build trust, too. Most important, this will change society for the better. When firms and people trust each other, most of the gotchas, fine print and exaggeration go away. People will be happier, and firms will be more successful, however they define success. Right now, most businesses treat people very impersonally, although they don’t mean to do this. Because they don’t relate to many individual people, they don’t know them, so they don’t trust them. You can’t trust someone you don’t know. Even more serious, many of firms’ processes and policies reflect their fear and mistrust of customers, employees and other important people. So people don’t trust firms, and this hurts business. All the fine print, noncompete agreements, NDAs… these are required in some situations, most can be done away with; they destroy trust. So What’s Involved in Drive to Trust? It’s quite simple. Through projects in diverse industries, CSRA and partners will show, quantitatively, that experiential gets amazing marketing outcomes, without marketing. We’ll demonstrate that experiential social media, which interacts in digital public to build trust, is good business. Business leaders assume it’s not possible to treat people personally—they think that’d be way too costly—but that’s because they haven’t discovered how digital social changes the economics of relationship. The network and annuity effects change the game. Experiential transforms business in 2 ways: it reveals people’s true behavior through many individuals’ real interactions. And it enables firms to interact with individuals to build trust at scale. I have another video that explains how we do it. Drive to Trust will show how trust-building gets much, much better marketing results than promotion does. 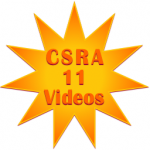 CSRA’s 11th anniversary videos delve further into trust building. If you’d like to learn more about Drive to Trust, see DrivetoTrust.org.